Since 1998, the American Library Association’s (ALA) Workbook for Selection Policy Writing has provided guidance to school librarians. After two decades, the document needed a makeover! Kristin Pekoll, assistant director at the ALA Office for Intellectual Freedom (OIF), had a vision. She wanted to expand the workbook’s usefulness beyond school library professionals to include public and academic librarians. In February 2016, Kristin asked three persons representing school, public, and academic libraries to meet during the ALA Midwinter Meeting in Boston to discuss the project. None of us foresaw that it would take twenty-two months, or until the end of December 2017, to complete the work. Granted, we spun our wheels for a few months until we devised a process that worked for us, and the project took off. Along the way, the membership of the group changed as individuals joined and left after finding they no longer had the personal or professional time to devote to the project. In the end, the core working group included public library representatives Jean Duncan McFarren (Ohio) and Kristin Whitehair (Kansas); academic library representatives Lisa Errico (New York) and Valerie Nye (New Mexico); and school library representatives April Dawkins (North Carolina) and me (Wisconsin) with Kristin Pekoll representing OIF. Beyond the core group, the ALA Intellectual Freedom Committee provided input as did outside experts: Martin Garnar (academic libraries), Jamie LaRue and Cindy Gibbon (public libraries), and Ann Martin, Pat Scales, and Angela Branyon (school libraries). 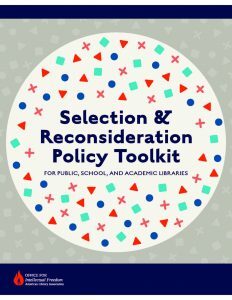 The “Selection and Reconsideration Policy Toolkit for Public, School, and Academic Libraries” is ready to use. The toolkit is organized into 4 basic areas: 1) Introduction–Why Do I need a Policy? 2) Basic Components of a Section Policy, 3) Reconsideration Procedures, and 4) the Appendix. Specific information and sample policy text is provided for public, school, and academic libraries. 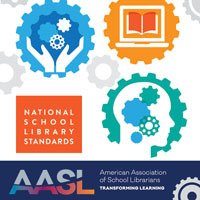 For each section of the toolkit, there is general introductory information, specific information for each type of library, and finally sample policy text for public, school, and academic libraries. Check out the Gifts and Donations section. Navigation is easy. At the bottom of each screen, there is an outline of the parts of the toolkit. The section you are reviewing is highlighted, so you can’t get lost. Take a test drive. School library-specific information and samples are easy to locate. Under the section “Selection Criteria” scroll down to the School Library Selection Criteria section. At the end of the criteria, you will find the Top Five Recommended School Library Reviewing Sources for school libraries. Beyond that, check out the “additional review sources” link which will take you to a table with over 100 alphabetically listed additional review sources for school, public, and academic libraries. Use the Appendix. It contains core intellectual freedom documents, information on challenge support, and a bibliography of additional resources. The toolkit is online, but shortly there will also be a print version available to order from ALA. Take a sneak peek at the print version with its color coding. School library introductory and sample policies are orange-tinted with public libraries represented by aqua and academic libraries by blue. The toolkit is intended as guidance. When creating or updating your local selection policy, don’t copy and paste the sample text. Instead, use the sample policy language as a place to begin local policy discussion, and adapt the sample text to fit your school library. The core group spent hours on conversation and email exchanges over such questions as “who may challenge a school library resource?” Check our answer and sample policy text under the link “Statement of Policy.” Although we provided sample text, consider your local circumstances and state laws. If you are attending the ALA Midwinter Meeting in Denver in February, don’t miss the opportunity to hear the core team who worked on the toolkit speak about it. The one hour session, “The Front Lines of Intellectual Freedom: Protecting Your Pages with Policy,” is part of the Symposium on the Future of Libraries. The session will be presented on Saturday, February 10, from 3-4 pm in room 404 of the Colorado Convention Center. Each attendee will receive a print copy of the toolkit. Cover and inside images from the “Selection & Reconsideration Policy Toolkit” used with permission from the ALA Office for Intellectual Freedom.